I know, you’re thinking ‘what on earth is she talking about?’! But bear with me. I was thinking about it the other day on one of our trips (read full day excursion) to IKEA. 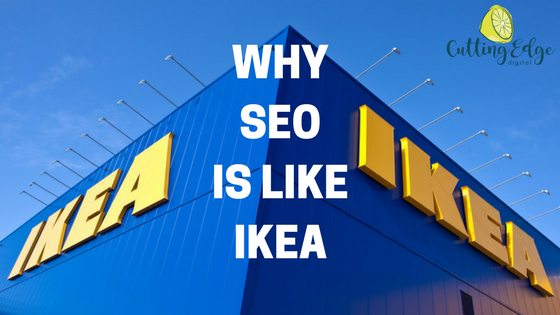 There are so many reasons why SEO is just like IKEA. It’s a love hate relationship to start with –we all love IKEA. The idea is so simple – go in, find what you want, grab a coffee and head back home. But is it ever that simple in reality? Nooooo. It is not. And especially if you have kids, an IKEA trip can be the day out from hell. Just like SEO – we think we go in, update our Yoast settings and wham bam, top of Google! But really there is so much more to it than that, which you only really discover once you’re in too deep and it’s too late to get out! Here are 6 reasons why I think SEO is just like IKEA. All the products in IKEA have random Swedish names. No-one actually knows what they all mean and I’m sure IKEA have probably snuck a few jokes in there somewhere but are we any wiser? Not really! Just like things being in another language, SEO is not that easy to understand. Some people have no idea what SEO even stands for. When you explain it, they get it though. Then you start talking about 301 redirects, meta descriptions, H1’s, canonicals and Search Console and you’ve lost them again. All IKEAs have a floor plan with a mapped out route they want you to follow as you go around the store. This is like SEO as usually there is a starting point and several destinations you have to tick off on your journey. The only difference here is that you can eventually get out of IKEA – but with SEO you can never truly leave (Hotel California style). Even though there are some key sections you should visit in IKEA, sometimes a sneaky shortcut will appear around the corner. Take it, and you’ll be propelled into the next section. Sometimes you even skip whole other sections too – winning! Or is it? Did you just miss out on some super cool stuff or worse, the one thing you actually came to IKEA to get? Now in the SEO world, there are different kinds of SEOs – white hat SEOs who make sure that they ‘follow the rules’ when it comes to ranking organically, and black hat SEOs – who won’t hesitate to take those sneaky shortcuts when they appear. You need to ask yourself which kind of SEO you’d rather work with. Everyone goes to IKEA for one thing in particular. You know the story – you need a couch or a bed or a coffee table. But do you ever leave with just that one thing you really needed? I would hazard a guess at almost no-one managing to make it through the IKEA maze without adding a few (or a million) extras to their trolley. Sometimes you don’t even get the thing you came for! Like SEO, you think you just have to do XYZ and then you’ll be ranking in no time. Not very likely. Most websites I optimise will have other random issues crop up along the way, whether it’s more content needed on some pages, better alt attributes for images or issues with SSL certificates. You might think you can just stick to your list of things to do – but you never can! Walking around IKEA is dangerous – so many practical and pretty things distracting you along the way. They almost shout at you, ‘Buy me! You know you need another set of neon pink placemats for outdoor use! DO IT NOW!’. Same thing with SEO. You’ll be happily working on title tags and then notice that the page doesn’t have any H1’s, so you start looking at other pages to see what H1’s are used across the site. Then you notice on the Screaming Frog crawl there are multiple pages with the same meta description, so you do a site audit on SEMRush and 50 million errors, warnings and issues appear. But you can’t do it all at the same time. You have to break it all down and do things bit by bit otherwise you will be overwhelmed with distraction and have actual website FOMO. Everything from IKEA is flat pack so you know when you get it home you’re going to spend hours (or days depending how much you’ve bought) building the damn stuff too. Like it’s not bad enough you’ve just lost 6 hours of your life wandering round a maze looking for a Billy Bookcase in brown ash veneer in the one size that will fit exactly in that gap in your living room, but now you have to build the bloody thing too! So many people get quotes for SEO and are flabbergasted at the cost, so they decide to DIY instead. This is all good and well for some people – but if you don’t have the time or the inclination to dedicate to learning what you need to do and how to do it, you’ll end up just as frustrated as when you’re building that Billy Bookcase. So if you want to optimise your website and don’t want to end up with a website that’s slightly skew and has that one random screw over that you just don’t know where it goes, talk to me today about how I can help you optimise your website at an affordable price. You’ll get it done right the first time and there will be no tantrums – promise! Get in touch with me online now – I’d love to help you! Want to keep up to date with the latest in the digital marketing world? Subscribe to my blog now! Ha! Genius. Ikea really is just like SEO. Especially the “you think you can DIY” part. I always end up with wonky furniture. Thanks Amanda! 🙂 I hate the prerequisite left over screw! Brilliant post, so clever! Got me giggling a whole heap. I have ZERO experience of SEO, but a whole heap in the IKEA store! I am the original FOMO so I just know that when I start to attempt investigating it for my website, I am going to be totally one of those people you describe above… actual website FOMO and masses of hours spent from one site to the next as I get deeper and deeper in !! Or perhaps I’ll just take your advice!! Definitely the wisest thing to do , we eventually came to the conclusion after years of shopping in IKEA that our (make that ‘hubbies’) time was more valuable spent doing other things and paying an IKEA master to build it for us. So when you put it like this, it absolutely makes sense that SEO should be left to the experts as well!!! ?? Laughed out loud at this ? – sounds just like my experience with SEO!